Blog How Quiet Are Bladeless Fans - And How Do Bladeless Fans Work? 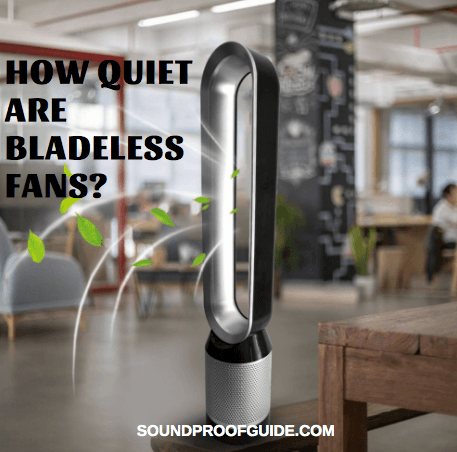 How Quiet Are Bladeless Fans – And How Do Bladeless Fans Work? Years ago I went into my local BestBuy store and saw something I had never seen before, a Dyson Bladeless Fan. The first thing I did notice was how quiet they are and also how modern it looks! But as more and more less expensive bladeless fans are coming into the market, I ask myself, how quiet are bladeless fans? So, How quiet are bladeless fans? Bladeless fans, in general, are between 37 Decibels minimum and 57 Decibels maximum. I got those figures from a representative from Dyson. 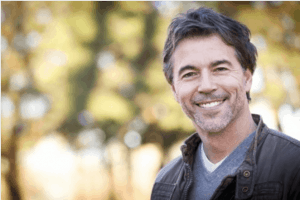 There are some cheaper alternatives out there that claim to be even quieter. I will be talking about how quiet these fans are, from the Dyson’s all the way to the less expensive alternatives. But first, let’s learn how these fans work without blades. Are Bladeless Fans More Energy Efficient? Why Are Bladeless Fans Quieter Than Regular Fans? What Are the Best Bladeless Fans? Bladeless fans work very differently than your traditional fan. They are much quieter and a lot easier to clean since you don’t have to open a cage to get to the blades. But how do bladeless fans work? The air is sucked in from the bottom of the base like a vacuum and goes through a mix flow impeller. The mix flow impeller gives the air high pressure and high flow. As the air goes up through the impeller it comes out through a very thin slot that spans the entire circle of the fan itself (not the base). When the air comes out of the slot, it flows over the interior side of the circle creating negative pressure multiplying by several times down an expanding cone. As the air flow exits as a cylinder of air, there is more air added on top of that called viscous shearing. So basically there are three stages the air goes through to give you the smooth stream of air you receive from a bladeless fan. Air comes out and flows over the airplane wing shape cylinder of the fan. These three stages the air goes through while a bladeless fan is turned on multiplies the air between one and sixteen times the original air flow. The first advantage, of course, is how much more quiet bladeless fans are compared to the alternative. As I was talking to a representative from Dyson they gave me the figures I stated above of 37 decibel’s minimum noise to 57 decibel’s maximum. Some less expensive knock-offs selling on Amazon or eBay claims to be as silent as 13 decibels but from the many YouTube video reviews I’ve watched proves that claim is FALSE. Many reviews, however, do state that the cheaper bladeless fans are still much more silent than regular blade fans. So there is still an advantage of buying a Dyson copy versus a traditional fan. Another significant advantage of having a bladeless fan is how much easier they are to clean. There are no blades to clean and no cages to unhinge to wipe off all the dust. All you need to do is wipe the entirety of the fan with a damp cloth, and you’re done. Fast and easy! This is an advantage that I never even thought of before trying out a bladeless fan. 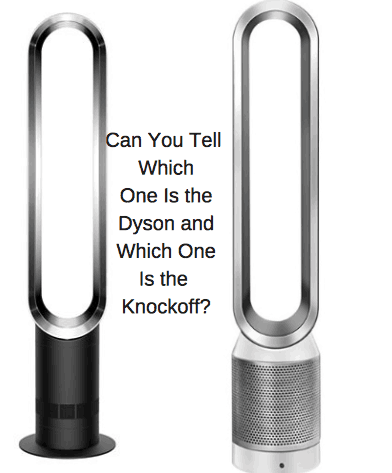 One of the videos from Dyson explains how the airflow is much smoother than a blade fan. This claim is very accurate after doing a side by side comparison. There are no blades to cut and then push the air towards me because there are no blades to do the cutting! All that’s left is a smooth flow of air that doesn’t seem as disruptive as a conventional blade fan. You would think that a typical bladeless fan would be much more energy efficient than a regular fan right? Well, they are, kind of. It depends which bladeless fan you compare to a blade fan. The range of energy consumption from bladeless fans is between 30 W/hr. To 50 W/hr. Give or take a few Watts of course. The range of energy consumption from blade fans is between 40 Watts to 100 Watts. Again, give or take a few Watts of course. What that means is if you were running a bladeless fan for one hour at 10 cents a KWh (0.03 or 0.05 kWh X 10 cents) would cost you between 30 and 50 cents for every hour the fan is running. That’s pretty cheap in my opinion. Now let’s calculate the energy consumption of blade fans to see how it compares with bladeless fans. If you’re running a blade fan at 10 cents a KWh (0.04 to 0.1 kWh X 10 cents) would cost between 40 cents to 1 dollar for every hour the fan is running. I would tend to guess that most blade fans of today would be more in the 70-watt range by looking through a bunch of specs from different manufacturers. It doesn’t seem like a big difference, but during a warm month with many hours of use, there will be a more noticeable difference. So all in all, bladeless fans, for the most part, are more energy efficient than regular blade fans. Bladeless fans are quiet for many reasons compared to their bladed counterpart. For one, you don’t have the whooshing noise from the blades pushing the air through the protective screen. The protective screen can also become a bit lose and cause a metallic vibrational noise as the two parts of the screen loosely touch each other while vibrating. There are also less moving parts and the moving parts that bladeless fans do have are very small an well refined. Of course, you will have the circular section where the air comes through that can move from side to side from the base. You may still have a grinding noise when the fans turn from side to side. The circular section is much lighter on a bladeless fan than a regular fan since it doesn’t have to support any moving blades. The quality of the fan is also a factor as to how seamless all the moving parts will work together. You can buy a bladeless fan that is dirt cheap that makes noise and doesn’t work very well just like you can buy a high-quality convention fan that makes very little noise. It’s better to do your homework and read as many reviews as you can before making your choice. Dyson Bladeless Fan Vs Cheaper Knockoff. After doing some research by reading reviews and going to my local electronics and actually look and listen to the fans, I can give you a few suggestions on what I think are the best bladeless fans out there. Dyson Air Multiplier AM07 Tower Fan is undoubtedly the fan that I recommend! I was lucky to buy one on sale through Amazon a few months ago. If you’re not in a big rush to buy a bladeless fan then wait until you can find a Dyson on sale. Click here to check the current price from Amazon on a variety of Dyson fans. If a Dyson is out of your price range then there are some less expensive choices that are still very good at their price point. The PureFlow QT7 Bladeless Fan (Amazon) is a good alternative to the Dyson. The difference is that it looks nothing like the Dyson. I think it’s pretty self-evident that Bladeless Fans are quieter than regular fans but there is a hefty price to be paid for the silence and futuristic look. Thanks for checking us out and let us know your opinion on the bladeless fan that you own.